My first course in the history of math was also my first independent study. I’d originally planned on taking the class in a normal classroom setting, but I did not meet the requirement of having taken an upper division math course (when I was registering the most advanced class I’d taken was linear algebra). Why this was a prerequisite for math history I have no idea, but the professor wasn’t going to budge. I mentioned my predicament to the computer science teacher I’ve been volunteering with for the past year and a half, and he told me to get in touch with his wife, a professor at Portland State. She’d taught the course as an independent study in the past and, thanks to my having volunteered with Chris, was willing to take me on without my having been her student before. The lion’s share of the course was based on The Crest of the Peacock by George Gheverghese Joseph. Joseph, a math historian, explores the mathematical traditions of several non-European cultures, including the Inca, Mayan, and Aztec civilizations, the Egyptians and the Mesopotamians, and the Chinese and the Indians. Joseph spends 50 to 100 pages on each culture, and explores the context in which the math developed, the impact it had, and of course the math itself. The book is largely academic in nature. Even so, I found it a very engaging read, and was constantly amazed at the information it contained. For example, the same mathematical strategies and ideas show up over and over around the world, even in isolation. These include decimal number systems, place-based number representation, and zero as both a placeholder and a value. There’s incredible variety, too, like the base-20 and base-60 number systems, the counting rods of China, and the numerical knot systems employed by the Inca. 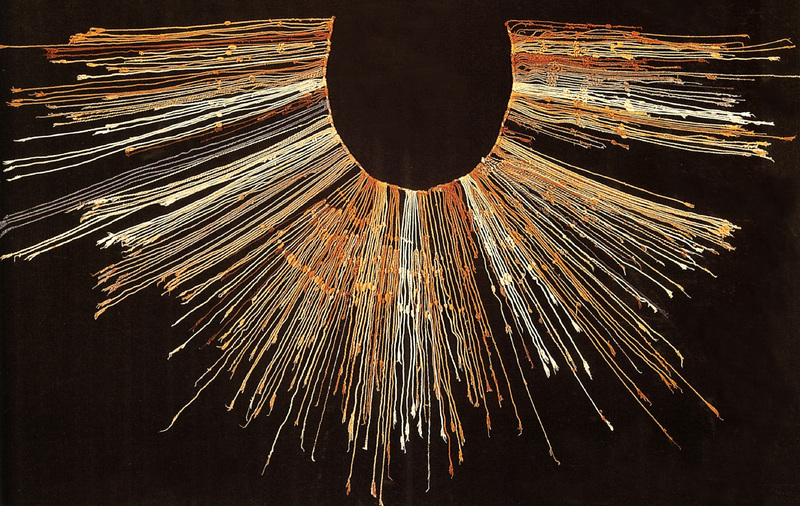 One of the few surviving quipu, a numerical knot system used by the Inca. Beyond the fascinating history and opportunity to question the Eurocentric nature of math history, the thing I enjoyed the most about the book was how thankful it made me to be able to employ a place-based, decimal number system, with zero and modern mathematical notation. After all, students struggle endlessly with math problems in elementary, middle, and secondary school. But how much harder would they be if students lacked the tools to translate them into something of the form ax + b = c? Of course, had I grown up using a different system then I’d surely judge Hindu-Arabic numerals and modern symbols as foreign and difficult, but I don’t think that it’s all relative. As proof, try doing long division in Roman numerals. It’s not easy. The next book, A History of Mathematics by Victor Katz, covered the Greeks, Euclid, and the Renaissance mathematicians. The text covers other subjects, too, but I was only assigned these three chapters. Once I’d finished with Katz I researched the history of calculus on my own. The classic story of calculus is the debate over whether Newton or Leibniz invented it first. Instead of taking this angle I decided to explore all of the pieces that the two men assembled into their systems of calculus, like the method of exhaustion, limits, etc. I felt like the math questions (problems, really) weren’t as good a fit for my blog so I just turned those in as normal assignments. My final project for the course involved a visit to a local art museum. It was small, as final projects go, so I won’t go into too much detail here, but I will say that it was one of my favorite parts of the term. In addition to my blog posts, math problems, and final project, I also met with Dr. Bartlo each week during her office hours. If I remember correctly these meetings were optional, but having taken over a dozen online classes now I try to meet with instructors whenever I can. And in addition to talking about math history, the regular meetings gave me a chance to pick Dr. Bartlo’s brain about math pedagogy, future course selection, and graduate school, which is the next step in my journey. I found this course to be straightforward, but I did encounter two challenges. One was the reading volume. I hadn’t read this much for a class since I was studying anthropology at Lewis & Clark. Thankfully, the reading was generally quite engaging and so it didn’t feel like a slog. The challenge lay in digesting and consolidating that much information into a good blog post. The strategy I eventually settled on was keeping a piece of paper in the book and then whenever I wanted to make a note, I’d write down the page number and a quick thought or interesting line from the book. Then when it came time to write the post I’d return to this piece of paper and use it as a guide. 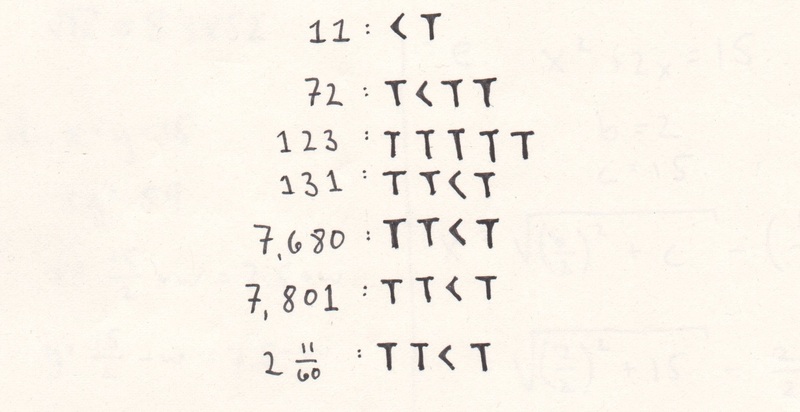 Several numbers written in Babylonian numerals. Note that the bottom four numbers are written with exactly the same symbols, which indicates a certain amount of ambiguity due to the absence of zero and a radix point. This ambiguity may not have mattered much, however, if the correct interpretation of the symbols could be gleaned from the context in which they were used. As for time commitment, I ended up spending more time on this course than on any other this term. When it was all said and done, I’d spent approximately 100 hours reading, writing, and meeting with Dr. Bartlo. I loved this class. Although I suppose I technically could’ve done it, becoming a math teacher without having studied the history of math now seems insane, like teaching physics without knowing the incredible stories of Galileo, Copernicus, Kepler, and Newton. I don’t remember a lick of math history being taught when I was in grade school, which may have been part of the reason why I struggled with it. In fact, I remember being surprised to learn that math even had a history. I can’t wait to work it into my own instruction. As for a critique of the course itself, my only regret was that I was not able to share my experience with other students. I liked doing an independent study, and wouldn’t hesitate to attempt another in the future, but I can’t help but wonder what other experiences and realizations I missed out on because I did it alone.